The long awaited, and truly great finale to the matched Trilogy, Reached met my expectations and exceeded them. In Crossed, we’re left with Indie and Cassia finding their way to The Rising, and we’re not quite sure what the status of Ky is. we don’t know for sure where he is and if he’s going to make it. We don’t know what finding the Rising means for everyone and what it means for all the folks back in Society. So, the Rising decides what role everyone will play, and it’s decided that Cassia’s best chance is to go back into the Society and work from the inside. That’s semi-good news since it means that she’ll get to be in contact with her family and with Xander – yet it’s leaving a lot up to chance with Indie and Ky who are assigned elsewhere. Cassia and Ky still have this bond though that they are holding onto in the hopes that they’ll manage to find each other again. Cassia is still one of the top if not THE TOP sorters out there and her skills are used over and over again to help both Society and The Rising. She’s being given jobs to work on that she’s not quite sure the outcome, yet it’s something that she’s been instructed to expect. So….as they are all part of the rising now, (come to learn that so is Xander), there’s a job to be done. The Society had created a Plague to be used against the Enemy, however it’s infiltrated it’s way into The Society. the Rising has a cure for it and wants to assume the role of ‘savior’ so that the people who are not yet a part of the Rising change ‘sides’ and go against The Society. Once The Plague has reached ‘epidemic’ stages, The Pilot is revealed to be a real person, and the Rising swoops in to take control and try to save the population. at first this is working, and Xander is at the helm of the medical side in one of the provinces while Indie and Ky are matched together to be co-pilots on airships bringing the cure to the people. Cassia is somewhat left in the dark about all this because she isn’t sure if she’s going to get The Plague or if she’s immune, and what her role moving forward is. she can’t get in touch with Xander, has trouble reaching Ky or Indie, her family and everyone she knows. She uses the valuables that she got from the settlement in the Carving to trade with the Archivists until her goods are stolen and she’s left with almost nothing of value. This means that she’s flying blind basically and has to figure out how to get to her ‘friends’ and loved ones. Through a lot of varied circumstances, important folks find one another in and relocate themselves to interesting places. Some that are heard of and some that were never even mentioned before. The Plague takes an interesting turn, and it’s origin an even stranger one. New characters are introduced, old ones brought back…and all in all, this longer last book of the series takes quite a few unexpected turns that left me both breathless and really surprised. I was very pleased with how this wrapped up the series – there’s a lot that was answered very nicely, and a few ‘what’s going to happen’ type questions left in my head. Kind of makes me wonder if Ally Condie is leaving things open to the potential of a follow up down the road since i think that there could be…but that’s also the part of me that isn’t ready to let go of my favorite folks. 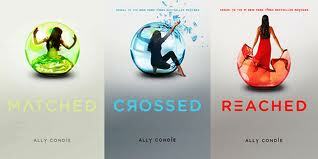 This entry was posted in Dystopian, Reviews, Young Adult and tagged Ally Condie, Crossed, Matched, Reached, The Matched Trilogy by iscm13. Bookmark the permalink.